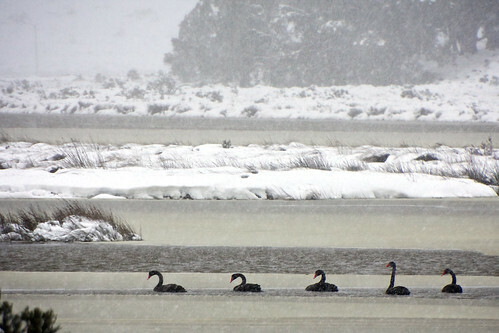 5 Swans a photo by BaboMike on Flickr. Another week, another work trip. This time round some succes, some fail. Normal basically. Last week I did the east coast towns, this time it was west, specifically north west. First stop Deloraine. Usually I believe it’s a maybe 3 hour drive. We had some snow related issues and took more like 7. Oops. Kinda got stuck in the snow. Well, not actually stuck, we did give up before getting really in trouble. This picky is of some very surprised swans in Shannon Lagoon, just before the town of Miena on the Great Lake. The lake isnt actualy frozen, it’s more of a slush layer getting all bunched up and blown onto shore by the crazy strong wind. The swans at first looked stuck, but hey were intact going slowly through a few inches of the slush.